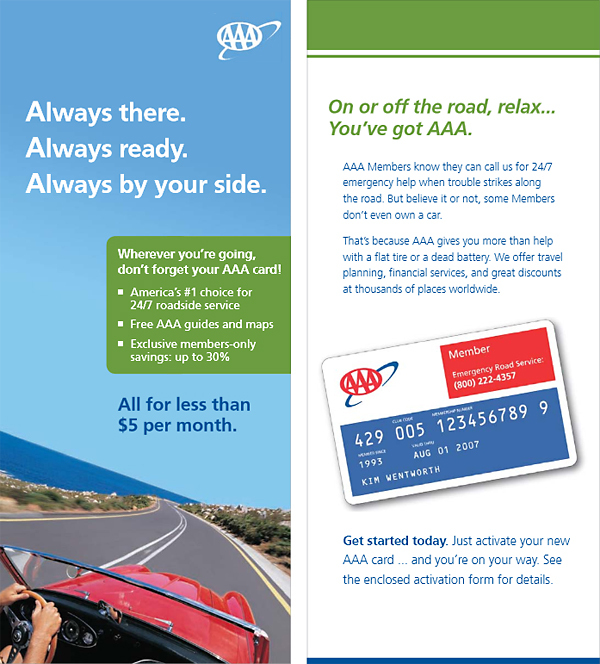 As the world's largest motorist organization, AAA already has significant brand equity with close to 50 million members. Most join simply for the assurance of roadside assistance, but there are many other little-known benefits of membership. The strategy for this package called for promoting the organization as both a source for reliable roadside assistance with additional benefits including discounts, travel planning, free maps, and more. The concept for this package, "Relax, wherever the road takes you, you've got AAA," promotes membership as offering both 24/7 roadside assistance and additional benefits well worth the membership dues. See excepts from this mailing below or read full copy in this PDF.